Knowing the precise temperature of your cooking can make the difference between a perfectly executed recipe and a disappointing dish. Range smart thermometers give accurate readings in a matter of seconds—and can alert your smartphone as soon as the roast, cake, or home brew is done. The Range app also remembers recipe successes, so they are ready to repeat next time. Developer John Kestner's idea for Range was a natural extension of his graduate work at the MIT Media Lab. There he explored the “internet of things” movement, which brings everyday household objects into the digital age. Made of food-grade silicone and stainless steel, Range thermometers have tough silicone cables that can withstand 450ºF. Leave one end of Range in the oven and the other outside, and read the temperature without even opening the door. Range comes in 3 models tailored to the task at hand. The Dial Smart Cooking Thermometer is best for indoor use, while the Grill model is best for outdoor grilling. 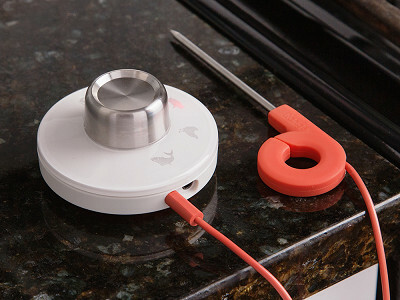 The Smart Thermometer is best for brewing or making candy, yogurt and more. But any model can be used to help you perfect any recipe. With Range, the benefits of connected cooking are delivered straight to your plate. Howdy everyone — I’m John, designer/founder at Supermechanical, where we make the Range smart cooking thermometer. Excited to be on The Grommet! Any questions about Range? I’m happy to answer them. Why not Bluetooth to eliminate the cord? @Robert Because Range uses the headphone jack, it can work with more devices. The app even supports older versions of iOS so that you can reuse that iPhone or iPod touch you upgraded from, now collecting dust. And since you're plugged directly into a device, you effectively have reliable, limitless range on remote alerts — Range uses your device's Internet connection to reach you on all your other devices even if you're across town. Nothing else can do that! @John Why not a Bluetooth dongle that plugs into the headphone jack to allow communication back to the thermometer? 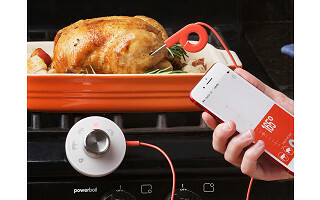 I wouldn't like the idea of my smartphone being tethered to the oven for the duration of cooking. Or am I missing something here? @Kevin I totally agree - I was interested until I learned it wasn't Bluetooth. 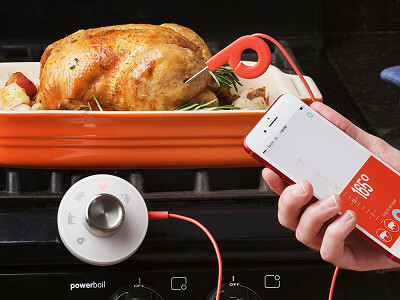 It's no different than the digital meat thermometer I already have, tethered to an external read/alarm. Another way it's different from your existing thermometer is the graph mode. Maybe it's only fun for meat, but if you're into homebrewing or a kitchen scientist, visualizing temperature over time helps get better results. I learned how to make good caramel by going over the graph with a better cook, myself. Bluetooth simply eliminates the local wire. You could still send iOS alerts over the internet -- that is a separate issue. This device would we perfect if you eliminate the tether. Hi Jan, thanks for the feedback! I'm sure John will be considering this as he continues to improve his product in the future. @Jan Good point. I think I was responding to an imagined question (sleep deprived new father here). When we developed Range, Bluetooth devices were getting bad reviews for poor range and reliability. I think things have improved, but designing for cost means things are less than awesome. We design for the best experience instead, and I think that we can bring Bluetooth performance up to our own expectations with a better battery and well-engineered chip antenna, both of which will lead to a stronger signal. It's something we'd love to do, when we can do it right. If that's the only thing that Range is missing to be perfect, I'll take it as a compliment, and keep working on perfection. :) Thanks! @James Just like spatulas or pans, it's nice to have a variety of tools for different situations. Though ours is pretty versatile. How high of a temperature do you need? Our probes are technically rated to 450ºF (though we've successfully stress-tested them at 500ºF for hours), and are the fastest you can get short of a Thermapen (which of course, can't be left in an oven or grill). Oh, and ±1º accuracy. Instead of typical consumer electronic plastic, we use food-grade silicone molded in Maine and assembled here in Austin with a ridiculous amount of attention to quality. Also check out our app ( https://itunes.apple.com/us/app/rangeo/id765277430 ). We've tried to make something that's a quick and elegant tool for cooks and nothing more. You might especially like the graph mode that lets you create your own Rangefinder visual guides for sugar stages, or use ours. These make it easier to monitor your recipe while doing other things. @John is the app available in other formats, like Android? Hi Kevin, as John mentioned below, the app is exclusively available for iOS, but stay tuned for potential updates! @Mike @John who doesn't have an old iPod sitting around. I think I'll tell a little elf about this. Maybe I'll get one for Christmas! @Kevin Yep, as long as that old device runs iOS 5.1 or newer, you'll be in good shape (and your steaks will be, too). You can even pick up one of those old iPod touches for $60 or so on eBay. Does the wire attach to the meat in the oven and come outside of the oven with the door shut to take temp? @Jennifer Yes, it does. That's how I made the Thanksgiving turkey! We use a high-temperature moisture-proof silicone cable that fits comfortably in your oven door's gasket, so you can just leave it in and not have to check your roast constantly. @Jennifer I forgot to mention, a nice little touch on Range is that it has a magnetic ring on the cable, so that you can keep the it nice and tidy against your oven. Credit to Risto for coming up with that in the middle of our Kickstarter. Will the Range work on my Droid phone and Galaxy pad or just the IPhone platform? Have you tested it for accuracy within certain parameters? @Robert Unfortunately, we're iOS only right now. When you're small, you have to focus on one thing at a time if you're going to do it well. Short answer, yes. At safe food temperatures, Range is accurate to within 1ºF, and at the extreme edges of its range, that rises to 3-4ºF. We've done extensive testing not just of the probe, but of the accuracy of the circuit that converts that into a digital reading. (That's commonly half the source of inaccuracy in digital thermometers!) I could tell you stories about how much work went into testing and selecting a temperature sensor that we were happy with. It was not easy to find something that was both extremely accurate and fast (under 5 seconds most of the time), but what we've got is the most versatile probe you can buy. This sounds like it would be a fantastic device if it connected wirelessly to your smartphone. Hi Lee, thanks for your comment. We appreciate when consumers like yourself provide feedback to our Makers for improvement down the line. I'm sure John will be taking this into consideration. what is the life span of the probe and cable with daily use? @joe We expect years of frequent use. We've been shipping Ranges for a year now, and haven't seen any significant problems. And we tested for weeks of 8-hour days at 500 degrees (above spec!) to make sure that this was something we could stand behind. A thermistor temperature sensor does naturally lose some accuracy over time, but we have a high standard for build quality that each Range has to pass, and things like completely sealing the circuitboard in silicone add to its durability. We make a top-notch product, so we're also pretty generous with replacements. 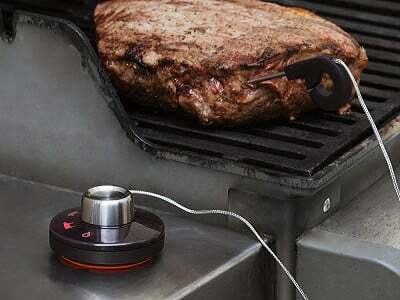 I'm an avid BBQer, and my ideal thermometer would be a dual probe with wi-fi sender that my iPhone or laptop could read. For low and slow BBQ I need to monitor the smoker temp as well as the food temp. Version 2 maybe? Where can i find the beautiful roasting pan? When do you plan on moving to other O/S's? Android in particular? @Josh Hopefully in the next year—it may take a hardware revision (not all Android headphone jacks are the same, oddly). Hi Timothy, thanks for the feedback! Those are great ideas As John continues to develop the product, I'm sure he will keep them in mind. @Timothy Yes, Range is pretty popular with home brewers — the HomeBrewTalk community in fact gave us input for the brewing temperature guide in graph model. Aside from Range also working with the iBrewMaster app, being able to submerge Range in your mash is handy (thermometers with braided metal cables are usually damaged by moisture). Great idea - I think being able to send alerts to Android devices is a reasonable compromise before we write a whole app. We'll look into it. I guess this is an Ipad/Iphone only device...too bad. Hi Timothy, as John mentioned above, hopefully you won't have to wait very long for more options.